The 2017 Hyundai Santa Fe in Phoenix is a standout model in the SUV segment. Complete with a new front fascia, taillights, dual exhaust outlet design and alloy wheels, the Santa Fe continues to impress today's buyers. 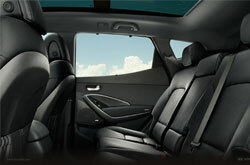 Additionally, the SUV once again comes in four trims: SE, Limited, SE Ultimate and Limited Ultimate. For 2017, each of these models are available in two new exterior paint colors: Nightfall Blue and Storm Blue. There is so much to admire about the new 2017 Hyundai Santa Fe in Phoenix. 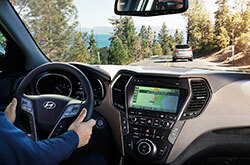 Coming into the new model year, the SUV adds a ton of incredible features, including a standard 7-inch touchscreen display with Android Auto, a standard 5-inch color LCD display, an available third-row USB outlet and optional next-generation Hyundai Blue Link. For drivers who like to travel, an 8-inch touchscreen navigation system is also available with Android Auto. Infinity premium audio is optional as well, and is a perfect choice for music lovers. A 3.3L V6 engine, outputting 290 horsepower and 252 lb.-ft. of torque, is equipped on the 2017 Santa Fe. It comes standard with a six-speed automatic transmission and is offered on both front-wheel- and all-wheel-drive models. When it comes to fuel efficiency, many 2017 Hyundai Santa Fe reviews praise the SUV for its ability to deliver 21 mpg combined, 18 city and 25 highway when outfitted with front-wheel drive. 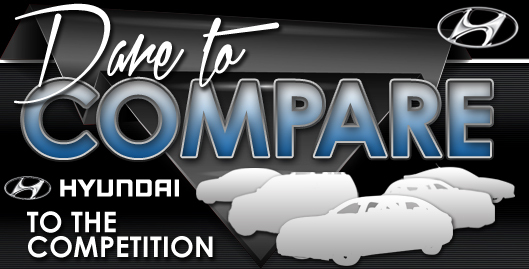 The all-wheel drive model produces similar numbers: 20 mpg combined, 18 city and 24 highway. Safety doesn't take a backseat when it comes to the 2017 Santa Fe. New technologies are available on the model this year, including Lane Departure Warning, Smart Cruise Control, Automatic Emergency Braking w/ Pedestrian Detection, Dynamic Bending Lights w/ High Beam Assist, and a Multi-View Camera System. Several 2017 Hyundai Santa Fe reviews also complimented the SUV for its standard rearview camera, which provides extra assistance for drivers. 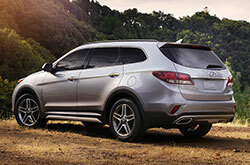 Is the Hyundai Santa Fe a Perfect Choice for Your Family? 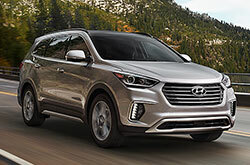 When shopping for new cars in the Phoenix metro area, you may have seen the 2017 Toyota RAV4, Mazda CX-9, Ford Explorer and the Chevrolet Equinox, but the 2017 Hyundai Santa Fe is also a great option. Its attention-grabbing exterior design and five-star in-car technologies may eclipse your expectations and meet your needs. Look over the tools in our review to find out if the 2017 Hyundai Santa Fe is a best bet for you, then browse the latest financing and leasing offers! 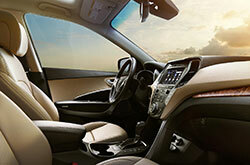 As your local car dealer, we're the location to go if you want to find the crowd-pleasing Hyundai Santa Fe. To help you make a sound decision when purchasing your next car, we've included this 2017 Hyundai Santa Fe review right on our site, making it easy and fast to find the details and specs you need. 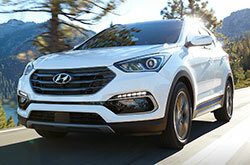 Stop by Camelback Hyundai in Phoenix, AZ, and examine the stately Hyundai Santa Fe upfront. Also take a few minutes to watch our video walk-around, which spotlights the car's modern equipment!